What do Mount Rushmore, St. Peter’s Square in the Vatican City, and the The Colossi of Memnon in Egypt have in common with the Des Moines’ City Hall? According to an article on the Medium Corp. website, they've all been cleaned with high-tech cleaning gear. For the past 40 years, Kärcher, a German-based company, has worked on nearly 180 historic monuments, landmarks and buildings around the world through its cultural sponsorship program in which the company provides free cleaning for cultural sites. The City Hall was in the middle of a two-year rehab project when Kärcher’s technicians started last October. The team used steam pressure cleaners to remove algae, fungi, lichens and deep-seated spores without damaging the building’s limestone exterior and granite base. 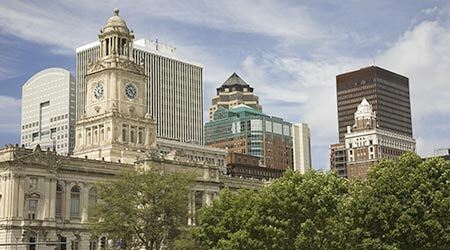 Kärcher’s technicians will return to Des Moines in July to clean the historic Police Station .